Development of the next-generation Opel/Vauxhall Antara will move to Opel's Ruesselsheim headquarters from South Korea and production of the compact SUV might also switch to Germany. "The successor of the Antara, which we will bring to market in 2014-2015, will be based on our global compact architecture for the first time," Opel/Vauxhall sales and marketing boss Alain Visser told Automotive News Europe in an interview. "The responsibility for this lies in our technical development center in Ruesselsheim. Thus we will insure that the Antara successor will be a very true Opel." Opel union boss Klaus Franz told ANE that the automaker is considering moving the SUV's output to Germany from South Korea, where it is made by sister division GM Daewoo Auto & Technology Co. Said Franz: "The next-generation Antara could be built in Bochum, just like the Zafira, which uses the same architecture. We are mulling which investment would be necessary and how high the potential sales volume in Europe would be. At of 50,000 to 60,000 units a year, production in Bochum would be viable." The current Antara shares GM's global compact crossover architecture with its sister model, the Chevrolet Captiva, which outsold the Antara in Europe last year 25,880 to 9,147, according to data from JATO Dynamics. Opel is counting on a sales boost from the Antara following the arrival of a face-lifted version of the SUV in Europe in May. That model will be the first in an expanded lineup of SUVs. "We will start an SUV offensive," Visser said. "At the end of 2012, a new compact SUV with extremely dynamic and sporty design will arrive." He said the new SUV will use GM's global small architecture and most likely will be made in Asia. Starting in 2015, Opel plans to sell 100,000 SUVs a year from these two models, a spokesman told Automotive News Europe. According to company sources, Opel is mulling a third SUV, which would be bigger than the Antara. Another key model debut for Opel/Vauxhall this year will be the Ampera plug-in hybrid, which is a sister model to the Chevrolet Volt that is already on sale in the United States. "We want to sell 10,000 to 15,000 Amperas a year at a price of 42,000 euros," Visser said. The Ampera and the Volt debut in Europe in November. According to company sources, the sales goal for the Volt in Europe is about 2,000 a year. 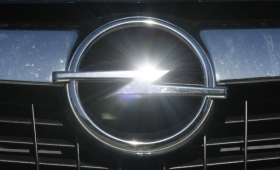 Overall, Opel/Vauxhall wants to further increase its sales, Visser said. "Last year we sold 1.2 million Opel/Vauxhall cars, this year we expect 1.2 million to 1.3 million sales. In 2013, it will be above 1.3 million." Visser added that 2012 "will be a key year for us, as we want to chalk up profits again." To achieve the sales goals, Opel will extend its global reach. It aims to sell 100,000 units outside Europe in the long term. "We've just started in Israel," Visser said. "Step by step we will export more cars to Chile, Argentina and other attractive growth markets in Latin America or the Middle East." In China, Visser said Opel wants to sell 5,000 to 10,000 cars this year.